The Cascadia subduction zone off the coast of Northwest California, Oregon, Washington State, and Vancouver Island BC could cause the worst natural disaster in the history of North America. The Pacific Northwest Earthquake could reach up to M9.0, trigger a tsunami, and shake for 3 to 5 minutes. Mother Earth slowly reveals her secrets, and this time, it’s a fault line deep in the belly of the planet. 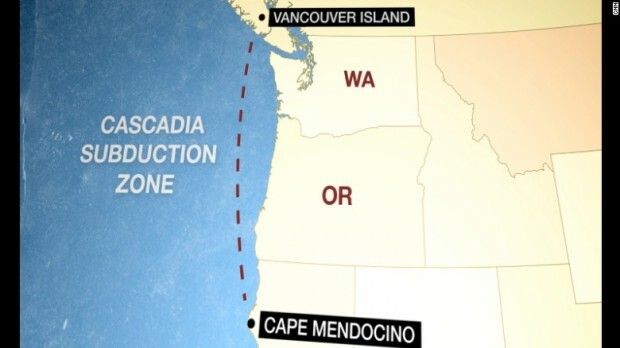 Its name is a whopper: The Cascadia subduction zone. Its gargantuan size and potential power amaze earthquake experts, who say it could cause the worst natural disaster in the history of North America — if it ruptures entirely. This quake-maker sits at the bottom of the Pacific Ocean, where the seabed meets the North American tectonic plate. In all, it stretches 700 miles along the Pacific Northwest, from British Columbia’s Vancouver Island to Washington to Oregon to northern California’s Cape Mendocino. Now it’s a question of when the Cascadia will strike again. 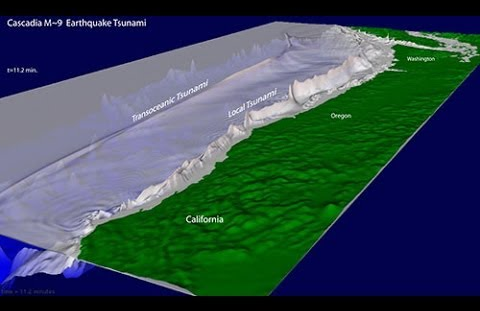 That big one could “hit at any time.” If the Cascadia were to experience a large-magnitude earthquake, the temblor and resulting tsunami could kill more than 11,000 people and injure more than 26,000, according to one FEMA model. Everyone knows the Cascadia’s cousin in California: the San Andreas Fault. It gets all the scary glamor, with even a movie this year, “San Andreas,” dramatizing an apocalypse in the western U.S. Truth is, the San Andreas is a lightweight compared with the Cascadia. The Cascadia can deliver a quake that’s many times stronger — plus a tsunami. “You’re going to have three to five minutes of shaking, and if you’re used to earthquakes in California, they typically last 15 to 30 seconds and before you are really sure of what is happening, it is over,” Goldfinger says. “Because there will be damage to all of the roadway, the various highways, various infrastructure, and it will be very difficult to get around and assess what is going on and how you might be able to reach people and provide them with some of the resources they may need,” said Maj. Richard Ouellette of the Civil Air Patrol’s Pacific region. Prior to the 1980s, the Cascadia was overlooked because it didn’t seem to move or cause quakes. 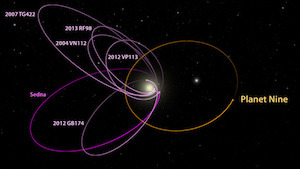 Scientists now know differently. “The more we learn about it, the less we like it, because it is turning out to be a big hazard as well,” Goldfinger says. To prove that Cascadia has ruptured before, scientists studied the so-called “ghost forests” of the Pacific Northwest. Underneath the plants and trees, dirt and mud, is a record of changes to the landscape. By digging into it, U.S. Geological Survey geologist Brian Atwater found the proof for one of the world’s biggest earthquakes. USGS geologist Brian Atwater shows a legacy from when the Cascadia ruptured in 1700: It created a tsunami whose impact is marked today by a layer of sand atop what was the forest floor, on a bank near Copalis Beach, Washington. He found that after the earthquake, the coast dropped about 5 feet, and then several minutes later, the tsunami overtook a spruce forest, bathing it with ocean water. The trees couldn’t survive in the salt water, but many of their hollowed out, dead trunks still stand today — markers of Cascadia’s devastation centuries ago. Through examining the rings on those remaining trunks and roots, scientists narrowed down when the Cascadia ruptured — between 1680 to 1720. Armed with this information, Japanese earthquake researcher Kenji Satake turned to diaries and logs from prominent families and temples of the Shogun era that go back to the 600s. The quest was to find a record of a tsunami that wasn’t accompanied by a storm or a quake in Japan. Scientists were already curious about whether a tidal wave could have come from a North American earthquake. After all, researchers concluded that South American quakes caused tsunamis off Japan in 1586, 1687, 1730, 1751 and 1837. From multiple records, it became clear that an orphan tsunami — devoid of shaking or a storm in Japan — did slam into its coast in January 1700. “There are fierce debates in the scientific community. You know about lots of details, but not about that main conclusion,” Atwater said. Unfortunately, you can’t see the Cascadia fault as you can the San Andreas, which leaves a visible line in some parts of California. The Cascadia lies underwater where the oceanic plate actually dives under the North American Plate. The “Cascadia subduction zone” derives its name from the Cascade Range of volcanic mountains that parallel the fault from afar and from how one plate subducts, or goes under, another.